Eco-Chic Handbag Solution: Vie Verte | Fashion. Style. Beauty. | Life is short. Live well. Ever been spring cleaning (or any kind of cleaning, really) and come across old t-shirts and jeans you don’t want anymore? What was once stylish or beloved either goes out to giveaway or into the dust rag pile but what if there was a solution to turn these items into fabulous handbag? There is: introducing Vie Verte. The brainchild of handbag designer Kathy Kaufmann, Vie Verte bags are made from a minimum 90% found materials predominately found in thrift stores or, you guessed it, your closet. 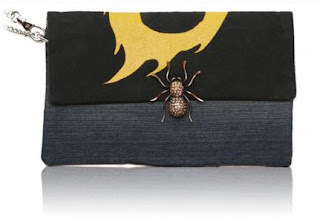 Kathy fashions old t-shirts, denim and brooches into one-of-a-kind clutches and totes that will have your friends “green” with eco-friendly envy. 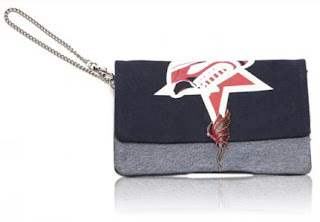 Examples of her finery include the Skeleton Clutch (at top), the Sneaker Clutch or the Batty Clutch, all just $40. 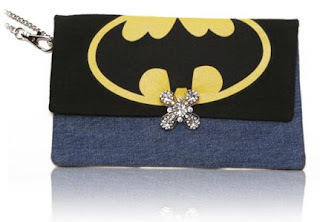 Order from her collection or collaborate with her on your own clutch or tote. Maybe that concert t-shirt can have a whole new life as a rockin’ handbag. Reduce, reuse and then reintroduce your favorite old clothes back into your wardrobe with a little Vie Verte edge!